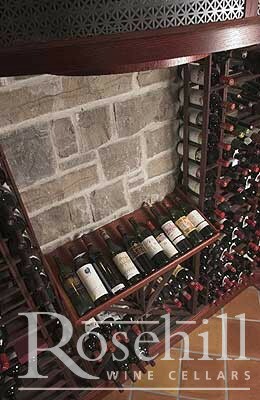 Redwood Premier Cru wine racks featuring angle display adjacent to stone wall. 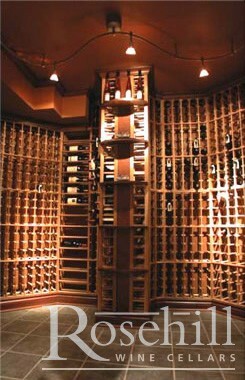 Cellar Pro Split cooling unit featured within a Premier Cru wooden wine rack cellar. Notice how the racks come up tightly to the cooling unit to help camouflage and blend into the racking. 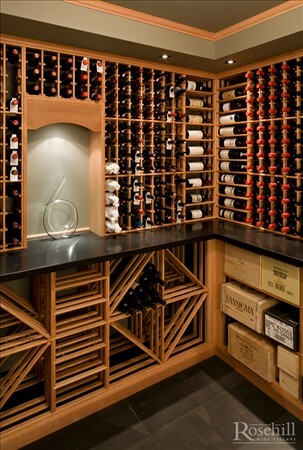 Neutral floor allows for racks and wine to be the focus in this traditional wine cellar. 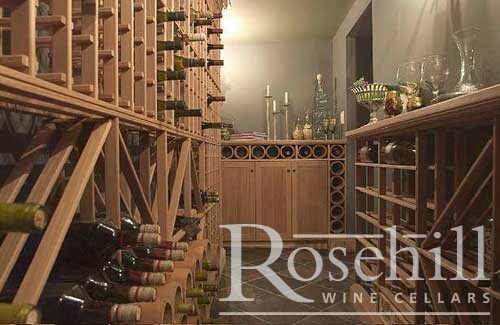 Modular redwood wine racks with custom base and crown allows for floor to ceiling continuation of racking. Even with angled wall the racks look like a custom fit. 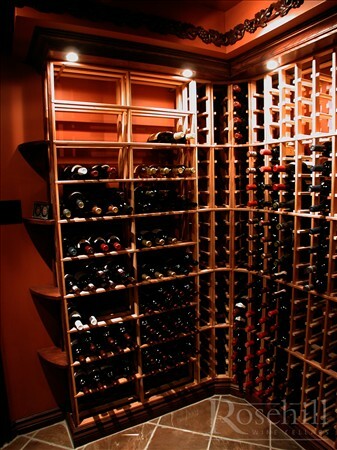 Lighting incorporated into our Premier Cru wine rack allows for showcasing your prized collection. Angle display is available in the curved corner rack as well as many other racking kits. Premier Cru Wine Racking within tight spaced cellar. Note the varying heights of racking to accommodate sloped ceiling. The racks meet up at 90 degree angle (filling piece was not installed prior to photo shoot) Sometimes a hard corner works better than curved corner in a tight space. 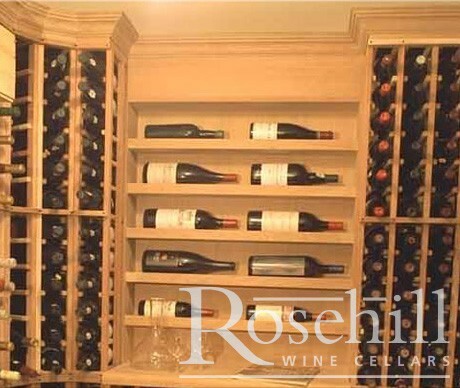 A custom looking wine cellar using our redwood wine rack kits. 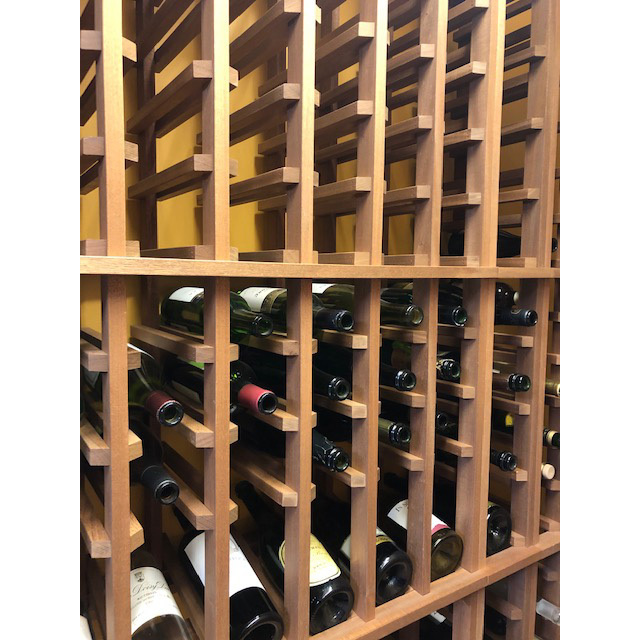 The custom wood grill helps to camouflage the Wine Guardian TTW 018 wine cellar cooling unit while still allowing for ample air flow. Wood trimmed stone threshold to separate niches within the the wine cellar. 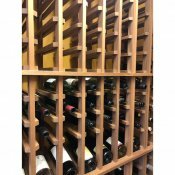 While we don't recommend staining the Modular redwood racking, this customer wanted a distinct purple look for his wine cellar. 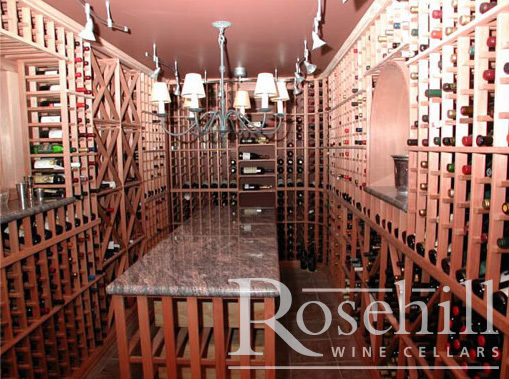 Notice the arched ceiling in this eclectic wine cellar. 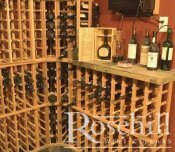 Inexpensive modular redwood wine racks used for this unique look. Ceiling wood applique provides a unique feature on the bulkhead. 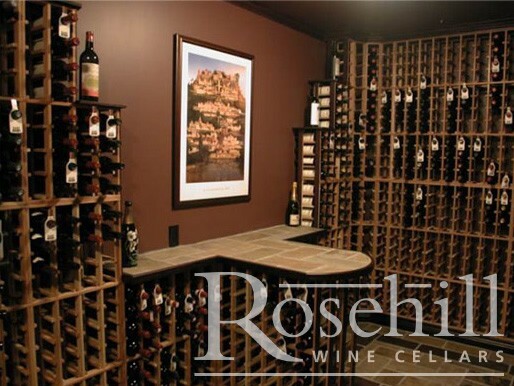 While the 72" modular racking has been replaced with the 48" and 32" we like the calming look of this cellar. Racks used are for both individual and bulk storage bottles. Modular Redwood Wine Kit with Glass Door and window. Half height racking under the window allows for full view of wine cellar from family room. 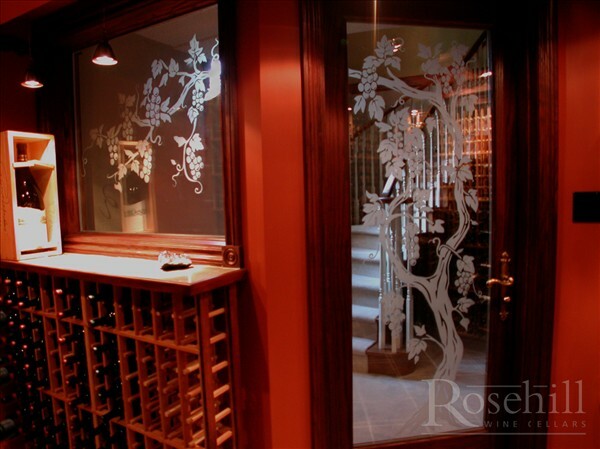 Glass door with etched grape vine display. 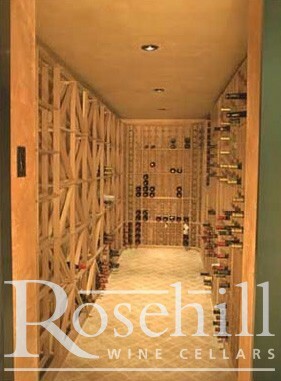 Floor to ceiling modular racking come under the bulk head for a custom looking wine cellar. Breezaire WKL 4000 cooling unit vents to adjacent utility room. Not the bulk display and closed door storage surrounding the Breezaire. One of our first wine cellars built in the late 1990's. Local artisan created a painted faux ceiling. 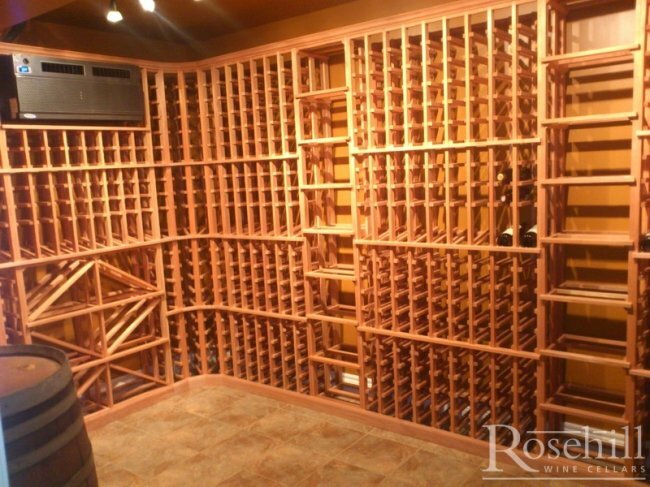 This timeless wine cellar features modular redwood wine racks. As you can see from the various photos, this is a large wine cellar that has been stained dark purple. Wrought ironc chandeliers and some black accents would enhance the look of the cellar to current vampire trends. 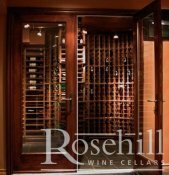 This wine cellar offers a wide range of storage options including indivdual bottle storage, bulk bins and wood case within peninsula display. Taking advantage of a natural jut out within the room we've incorporated a custom vertical display. Larger crown moulding and vaulted ceiling enhance the look of the stained modular racking. 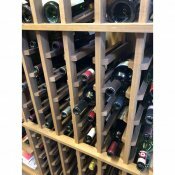 Taking advantage of recessed wall to create horizontal display shelves, the modular redrack wine racking can incorporate into a variety of wine cellars. 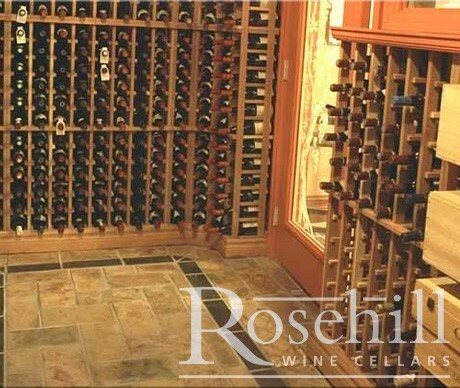 This cellar features both bulk and individual bottle storage. 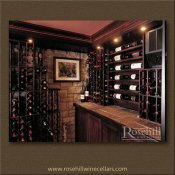 If wine cellar is large enough then a stand alone table in center of room is often desired. Stained Modular Racking with Horizontal Display Shelves to showcase bottle labels. Pot lights can be an energy drain if not insulated properly. 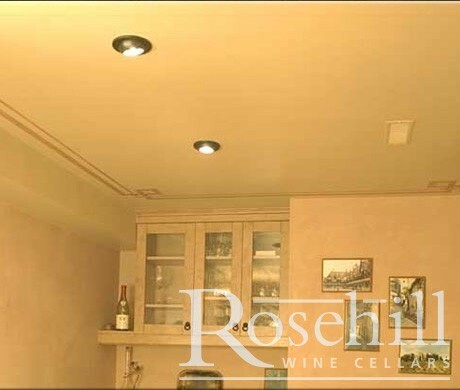 We often prefer surface mounted lighting in our cellars. 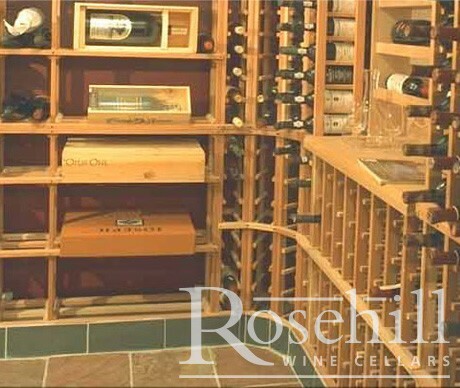 This wine cellar features modular wood racking with end cap display shelves. 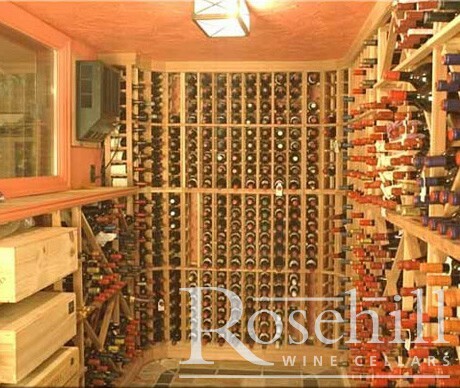 Circa 1999 - this wine cellar still stands the test of time. 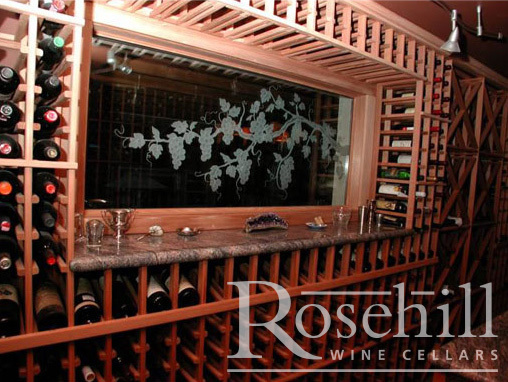 Modular Redwood Wine Racks incorporated with custom wood trim allows for a showpiece cellar. Horizontal display allows full view of bottle and label. The larger crown moulding and custom wood details allows for inexpensive racking system to look custom. 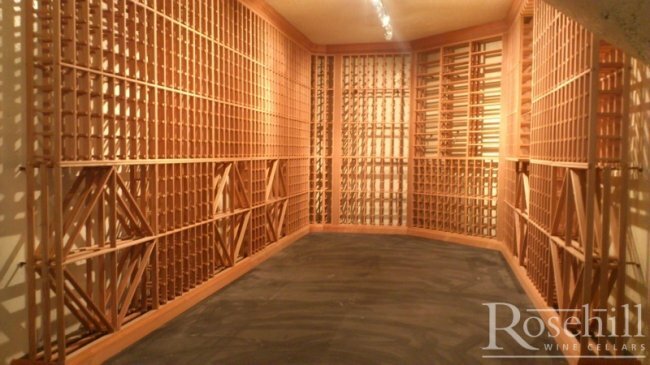 Floor to ceiling continuation of racks allows for a custom looking wine cellar. 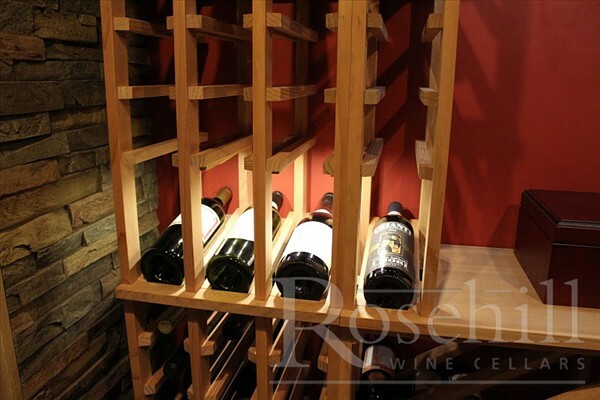 The modular redwood racks looks best when customized to fit any cellar. 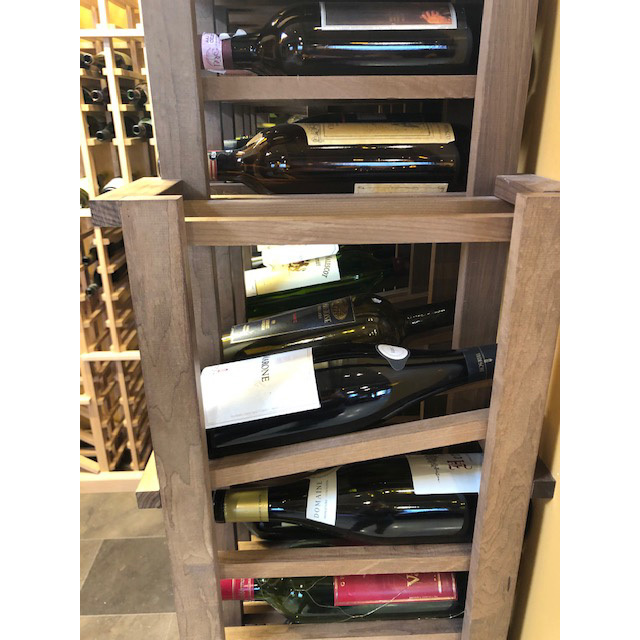 These wooden wine racks can be cut in height and width to fit varying walls. This image shows the with racking being incorporated with custom display elements. 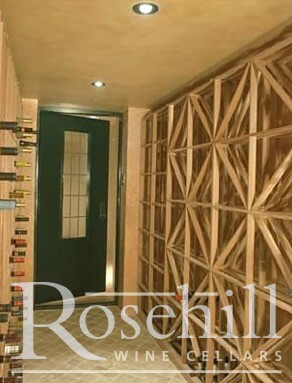 Mid 1990's wine cellar with faux textured ceiling and inlaid floor tile detail. 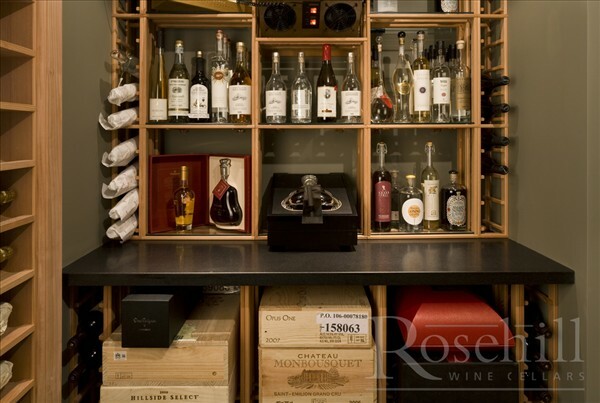 The modular wine racks allow for wall to wall continuation of racking allowing for individual and bulk storage options. The InterKool 600 (AKA Koolspace KoolR) lasted for close to 15 years. It didn't need replacing but when this cellar was redone it was replaced with a WhisperKool SC 3000. Slate Floor - still great! After all these years, the cellar & floor is still one of our favourites. The necks of the bottles stick out with modular racking allowing for cellar collection to be tagged with neck tags. Larger format bottles can be incorporated into wood case or bin racks. 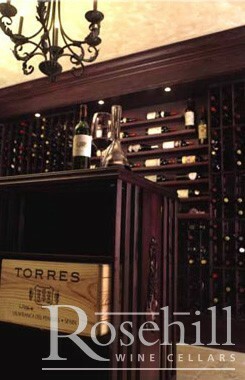 These bottles of wine and champagne can also be featured in individual display racks, please inquire. 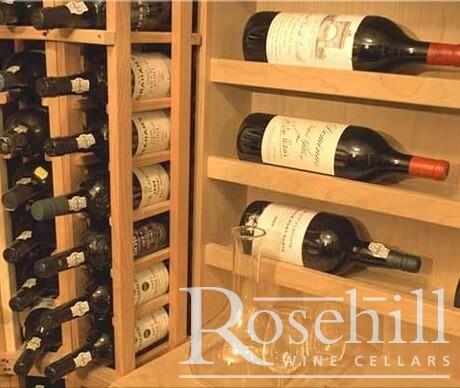 Modular redwood racking provides a lot of flexibility for your wine storage needs. 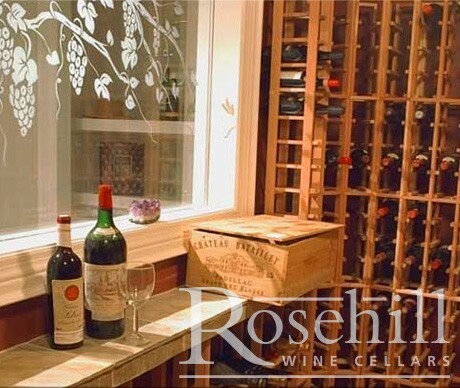 Etched grape vine display on window to wine cellar with home for Haut-Brion within modular redwood racking. Adjacent wine cellar tasting room. Amethyst stone was our trade mark for several years. Bacchus mythology always relevant when drinking wine. Salut. 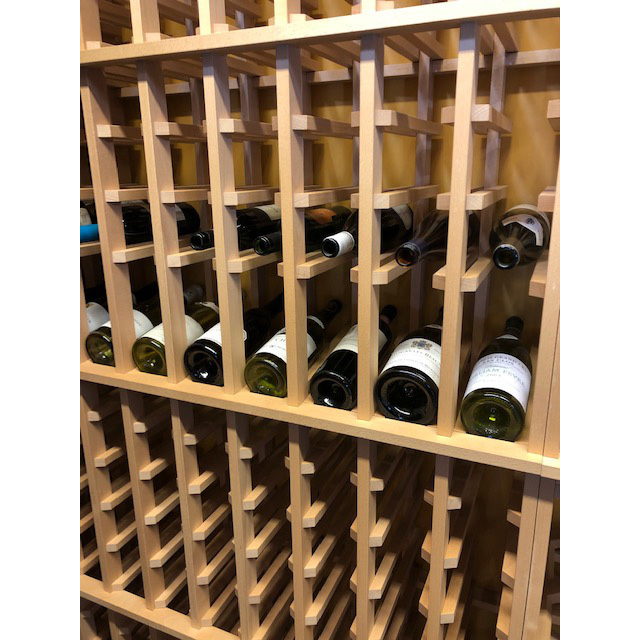 The 72" modular redwood wine racks have now been updated to the 48" and 32" system to allow for greater height variances. The new redrack racking now uses all heart redwood for more consistency of colour. We still like this image as textured walls look almost like leather or raw hide. Many cellar cooling units are now designed to incorporate within the racks. Therefore, the racks can come up very close to the cooling unit helping to camouflage it. This older style of wall mounted cooling unit needed have to more air circulation and access to drain line. 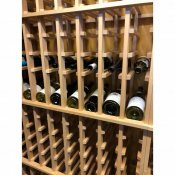 Redwood kit wine racks allow for individual bottle storage. 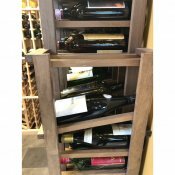 Individual bottle storage is featured in this modular wooden racking cellar. 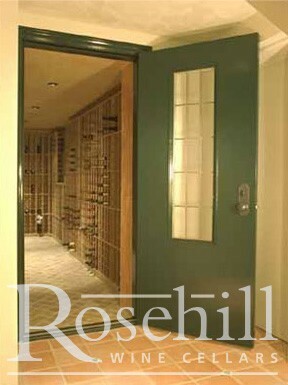 Climate controlled traditional cellar will assist to protect your wine for many years to come. Notice how the 45 degree angle pieces run together in the diamond bin racks. The F05A and F05B diamond bin racks are always a popular look. The diamond racks are practical if you collect a number of similar bottles to be stored together within same bin. Straight Bordeaux bottles also store in bulk better than sloped burgundy bottles. Also, if you collect only 2 or 3 of a certain bottle than individual bottle F01A, F01B, F02A, F02B may be a better route to go. 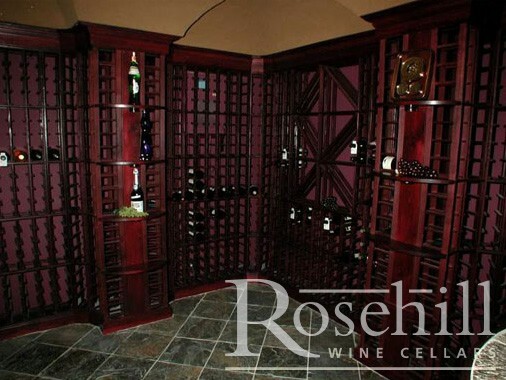 Octagon shaped wine rooms or cellars with angled walls are always a challenge for display. Custom racks may be the route to go, but you can achieve a similar look with kit racking cut to fit. Diamond bins on one side of this cellar with individual bottles on the other. 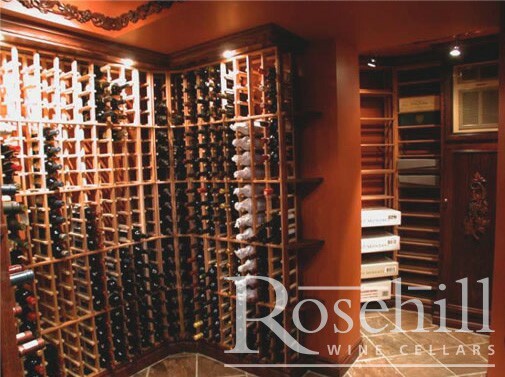 This wine cellar has incorporated a variety of racking styles for varied storage. Bulk bins can be used for bulk storage, larger format bottles, wood case or individual display box storage. 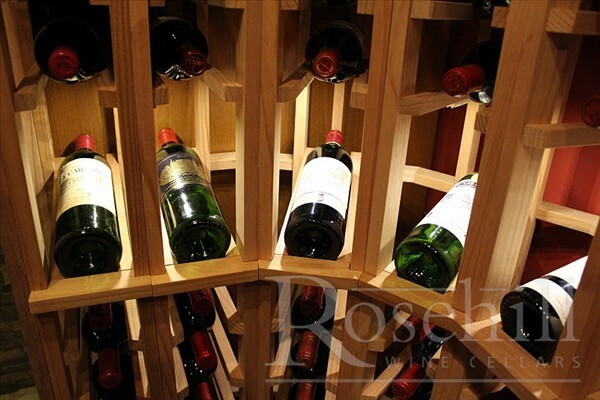 The modular redwood wine racks offer a number of different modules to mix and match to your collecting style. 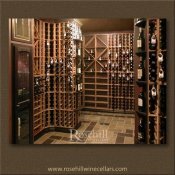 This large home wine cellar features stained modular redwood wine racks and stand alone tasting table. Symmetry created on either side of the stone display for classic looking cellar. Large base and crown moulding allow for floor to ceiling continuation of racks. 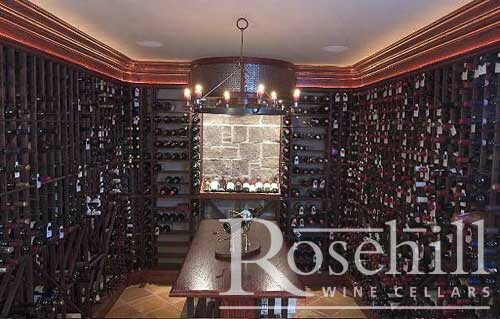 This climate controlled wine cellar houses the cooling unit behind grill which is visible behind chandelier. Metal Grill to Hide Wine Cellar Cooling Unit. Stained modular racking with display angle for featured bottles incorporated to display niche. 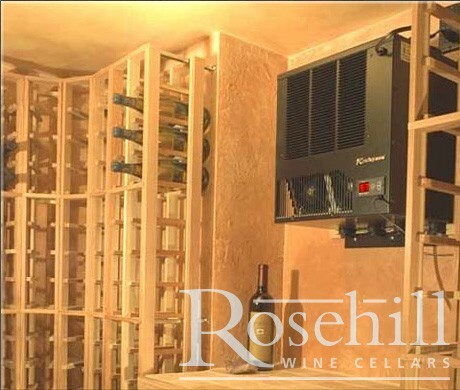 The cooling unit for this wine cellar is hidden behind the metal and wood grill at top of picture. 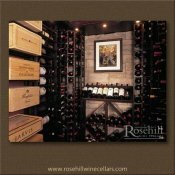 Stained modular racking are incorporated to a display cabinet within this traditional wine cellar. 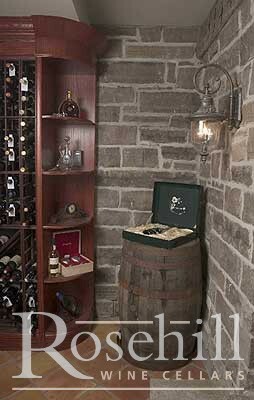 While bottle capacity is more limited in this cellar, the lack of racks allow to showcase the natural stone walls. An old wine barrel serves as a display area of prized bottle. 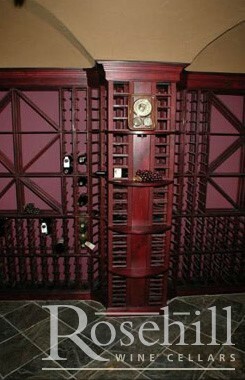 "Snazzy" wine cellar for snazzy wine lover. Modular wine racking with incorporated Breezaire cooling unit. 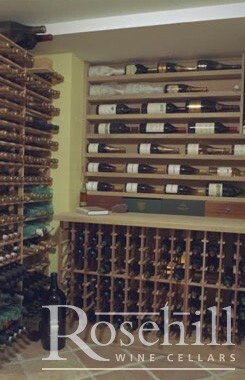 An efficient use of racking and space for this serious wine collector. 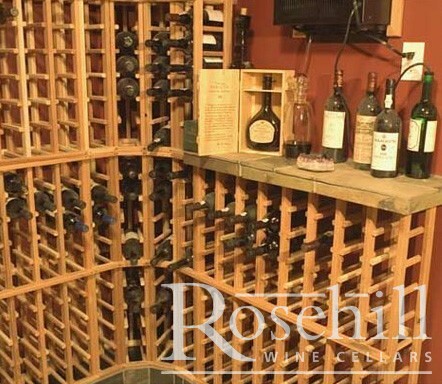 The cellar showcases the modular redwood racking kits in their purest form. Notice the double horizontal gables where the top individual bottle rack meets the diamond racks below. This is a clean look that allows the modular racking to be so inexpensive as the racks themselves are only 32" or 48" high. 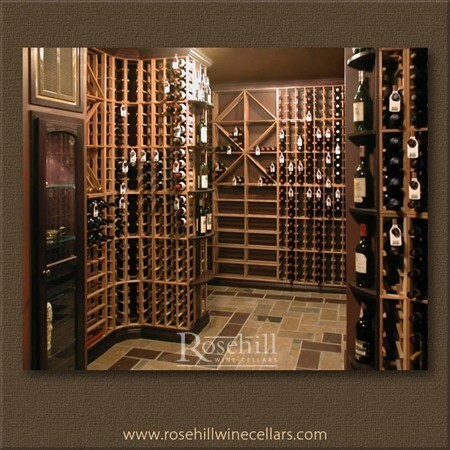 Terra Cotta storage for individual bottles and closed cabinetry complete this cellar. 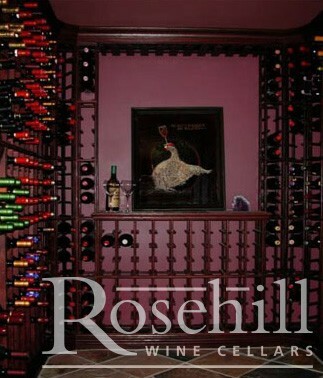 This wine cellar photograph almost looks like a still life image with the various wine accessories. This cellar is a flashback to the 70's including Chianti bottles and the terra cotta bottles holders. While we normally wouldn't post duplicate images on our site we liked the filter the photographer used for this image and it shows a closer image of the closed cabinetry. Modular redwood racking in 72" height create a cascading effect to highlight art on wall. 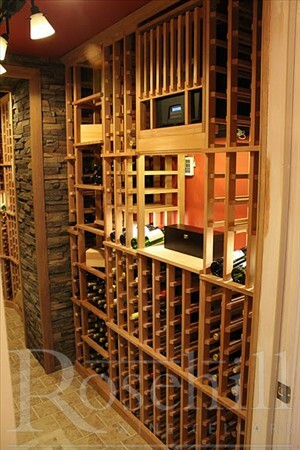 The kit wine rack has been cut to both left and right waterfall style adjacent to the peninsula within wine cellar. 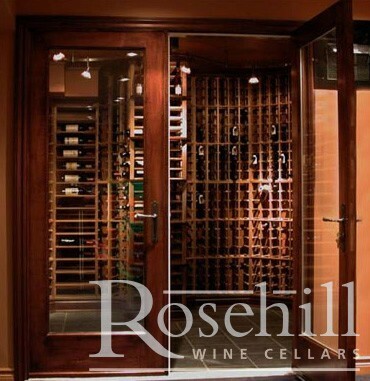 Wood trimmed exterior doors allow for grand entry to this traditional wood wine cellar. Modular racking has been cut to fit the various niches with the cellar. The redwood redrack allows for use with neck tags to categorize your collection with tasting notes and drink by dates. This tasting room adjacent to wine cellar can comfortably seat 8 wine lovers. This images showcases the painting detail on the ceiling. 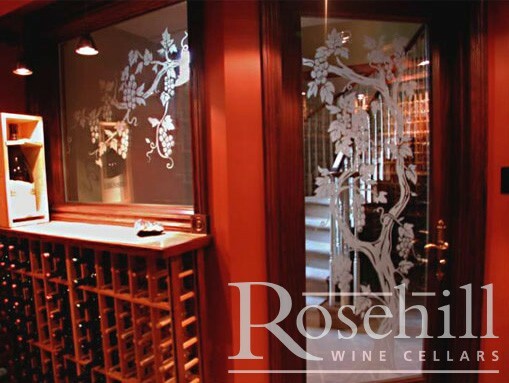 Etched Glass with grape vine display allows viewing of wine cellar from adjacent tasting room. Angle display to showcase bottles is below counter top. Amethyst stone centred on display top in homage to wine god Bacchus. A tight fit for a narrow wine cellar but they were able to incorporate stand alone island for additional bottle storage and wood cases in the centre of the room. 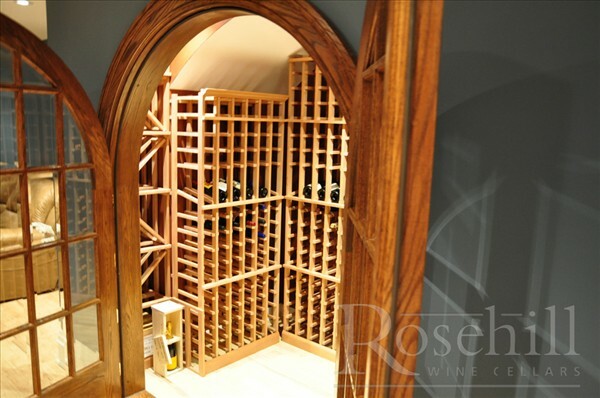 Arched focus point and display angles are amongst the features of this custom wine cellar. Thicker, deeper and with more of a presence the wood racking kits can provide a custom look at a fraction of the price. Note the cooling unit is tucked behind the racks - this is an unorthodox install and the customer needs to be very careful not to put bottles in front of the cooling unit to restrict the air flow. While not recommended, occasionally customers will request this install to hide the cooling unit which they've recessed in the wall. 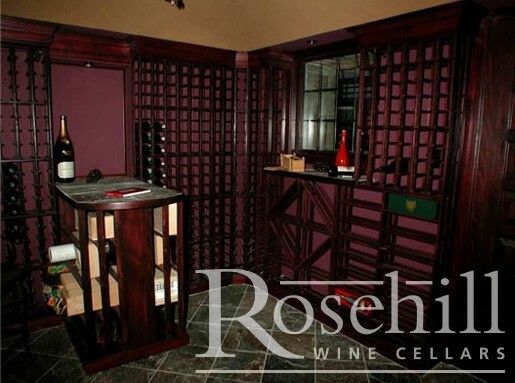 This Oakville, Ontario wine cellar features dark stained modular redwood racking. Lighting incorporated into the bulk heads for ambient lighting. Closed door cabinets allow for storage of liqueur, beer & water. Cellar is cooled with InterKool 600, through the wall cooler. 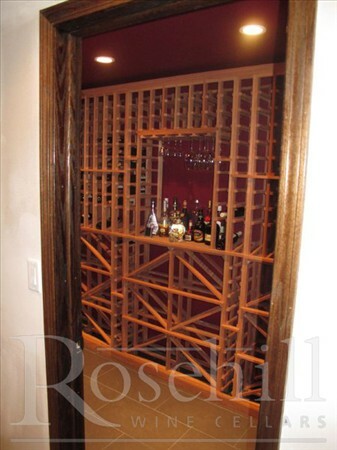 (SL) Modular Redwood RedRack wine racks are used in this custom looking wine cellar. 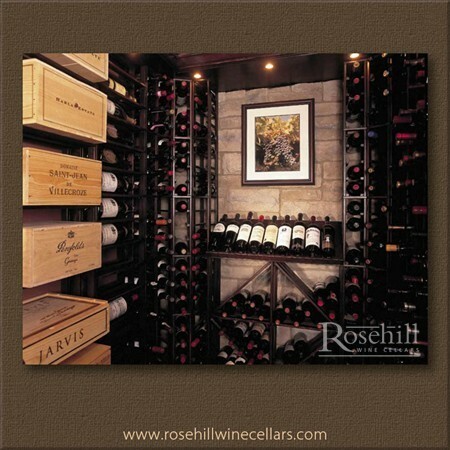 A custom cellar look at a fraction of the price. 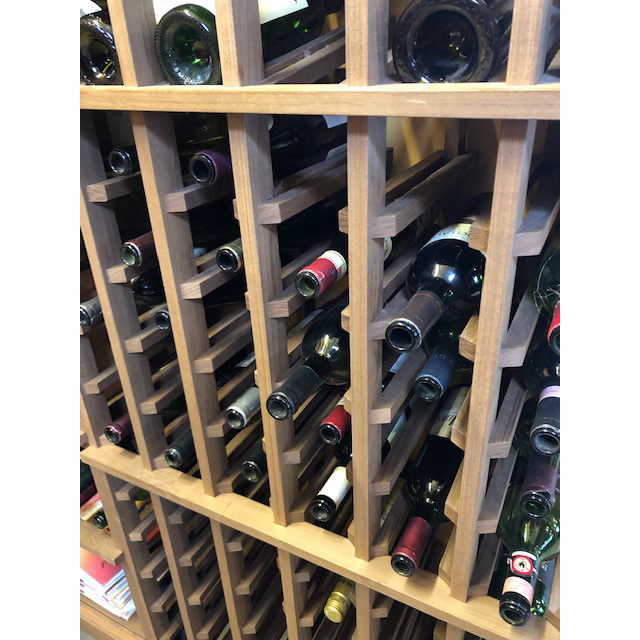 Note that the lower section of wine racks are double deep to allow for extended counter top, this can easily be achieved with the F19C connector brackets. F08A Magnum Champagne bins and F05A diamond bins, make for an eye-catching lower storage,. Also in the lower section of the cellar, horizontal wooden box storage is provided, this is more of just an open bin area to store boxes as opposed to the F24C wood case bin which is available with the modular racks. The arched facia tasting niche is supported by a granite countertop. This counter rail separates the upper and lower storage. Within the tasting niche, a beautiful Riedel Black Tie decanter is displayed under the curved arch. 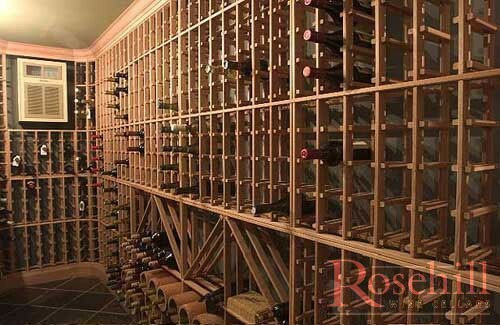 This cellar really looks custom given the wall to wall, floor to ceiling continuation of racks. It is a prime example of how good the modular racking can look when custom details are added in. 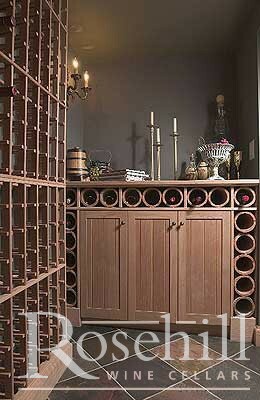 Dark stained wine racks almost look black for a contemporary looking wine cellar. 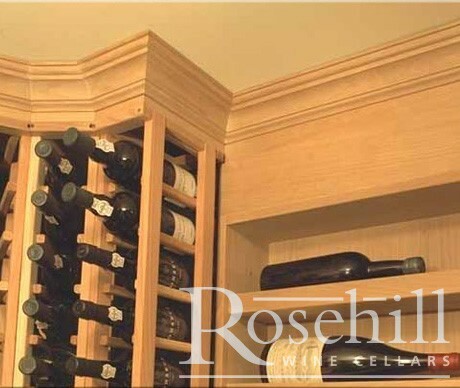 Plenty of sideways display storage to showcase wine bottle labels. 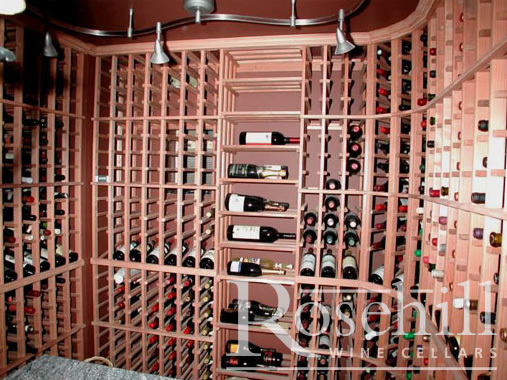 Stacked wine case storage allows for efficient use of space within this cellar. 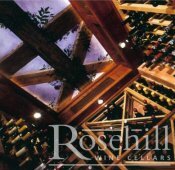 Reliable functional California Redwood kit racking customized to suit an unique wine cellar location. 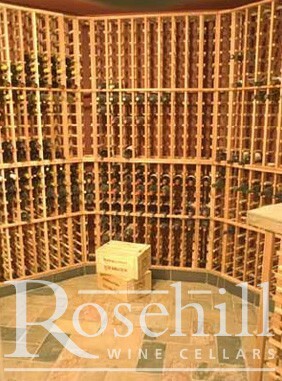 A combination of diamond bin racks, individual single bottle racking, and case bins makes up the storage options within this cellar. Close up of the BEECH wood sample for the Premier Cru Line of Wine Racks. Close up of the MAHOGANY wood sample for the Premier Cru Line of Wine Racks. Close up of the MAPLE wood sample for the Premier Cru Line of Wine Racks.